The Lions held a skittles night on 27th September and a great night was had by all. We would like to thank the organiser Julie and everyone that attended and made the evening the great night it was. 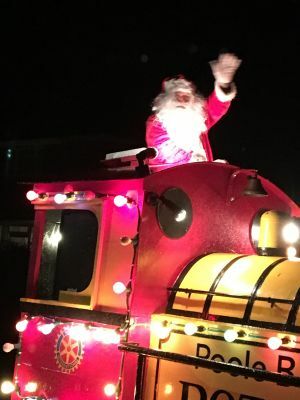 The Santa Train was seen touring round Broadstone tonight (08/12/18) and was supported by lots of local children and parents who came out to wave. 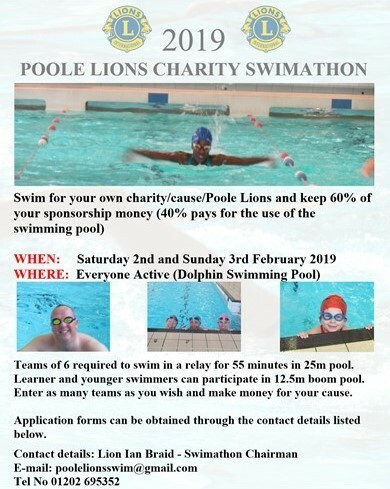 There is still time to register a team for the Poole Lions Swimathon. This year you can swim for any charity you want to and 60% of the sponsorship will go to that charity. Also don't forget about trying to win one of our prizes. We meet on the 1st and 3rd Thursday of every month. The International Diabetes Federation estimates that 371 million people worldwide have diabetes, a global epidemic that is expected to affect 552 million by 2030. Over the years the Lions Club of Poole have collected thousands of pairs of glasses in partnership with other local Lions Clubs which we have sent to be cleaned, refurbished and then distributed to countries where the majority of the population cant afford to buy a pair of glasses. We are all becoming dementia friends and we can support you to do the same. Either go to our page to find out how we can help or click the link to go direct to their website.